Below is a post I offered at The Conversation last week, where you will find some comments. Unlike almost everything else on this site, the entry below benefited from the good attentions of an editor, Emily Schwartz Greco. A gaggle of young activists recently paid Dianne Feinstein a visit at the senator’s San Francisco office, imploring her to support the Green New Deal framework for confronting climate change. She responded by explaining the complicated legislative process, emphasizing her decades of experience and promising to pursue a considerably more modest approach to confronting climate change with a better shot at passage in the Senate. The lawmaker tried to come across as sympathetic, yet sounded condescending in a short video clip that quickly went viral, eliciting a stream of criticism. A longer version told a more nuanced story, including why she believes her own “responsible resolution” has a better chance of passage. It’s easy to understand why Feinstein’s confrontation went viral. Saying “no” to earnest children who see their futures in jeopardy makes politicians look callous. Although the advent of social media has made it easier for millions to witness these awkward encounters, there is nothing new about kids engaging in grassroots activism. And based on my research about social movements, I find that today’s young activists have a lot in common with the leaders of earlier youth movements. This clip of Sen. Dianne Feinstein arguing with a group of students about climate policy went viral. Young people often appear at the front lines of social change for three main reasons. First, young people may refuse to ignore injustices or wait patiently when they feel passionately about a cause. That means they’re more apt to take risks. During the civil rights era, Ernest Green, Thelma Mothershed and seven other children known as the “Little Rock Nine” followed federal troops past jeering crowds of white teens to integrate Central High School in Arkansas in 1957. More than 60 years later, the dean of students at a public high school less than an hour from Little Rock paddled three high school students for walking out of school to protest gun violence. 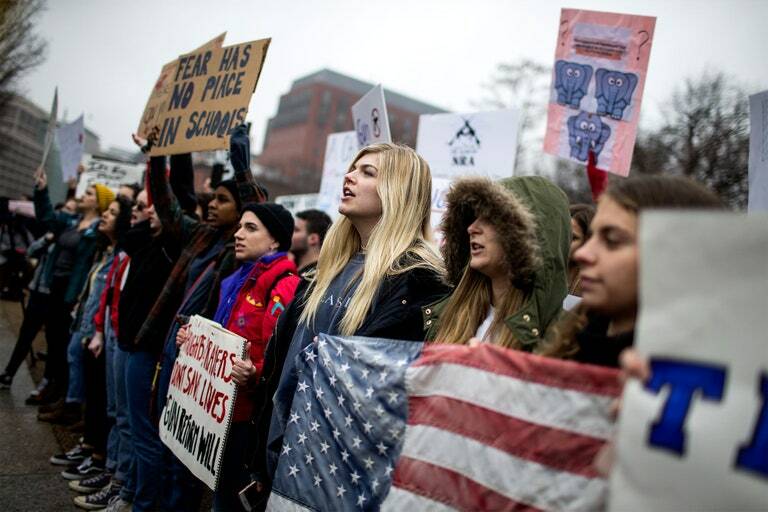 In both instances, young activists took risks that would scare off most adults. Second, politically engaged young people can create dramatic and appealing images to dramatize their cause. That’s what happened when Martin Luther King Jr. put schoolchildren at the front of a march for civil rights through Birmingham, Alabama. He surely knew they were likely to face police willing to use firehoses and dogs to disperse the crowds. The visuals horrified the nation and inspired more action not only in the streets but in Congress – which passed the Civil Rights Act of 1964 soon after that showdown. Third, dismissing or attacking young activists who appear earnest and sincere can prove perilous. When Birmingham’s children’s march was met with police violence, national attention forced civil rights to the top of the White House’s agenda. It also cost Bull Connor, Birmingham’s public safety commissioner, his job. Before Feinstein’s awkward encounter went viral, Fox News host Laura Ingraham experienced a similar snafu when she ridiculed gun-control activist David Hogg. The pundit teased the Parkland shooting survivor after he didn’t get into any of the four California universities at the top of his list, a move widely perceived as bullying. Hogg’s youth made it tough for Ingraham to attack him. His political savvy made it even tougher when he tweeted the names of Ingraham’s sponsors, and suggested his supporters boycott her show. Ingraham eventually apologized, but only after losing some sponsors. Hogg won this political standoff and even more. He will enroll at Harvard University in the fall of 2019 – along with Jaclyn Corin, a fellow Marjory Stoneman Douglas High School graduate and March for Our Lives co-founder. Like other youngsters before them, its members claim to have greater stake in forceful environmental action than their elders. Unlike many of the adults who call the shots on policy, they expect to be around to face the consequences should their leaders keep failing to take forceful action on climate change. American kids and young adults are making these claims not only in the halls of Congress but also in court. More than 20 young people are plaintiffs in a federal lawsuit, Juliana v. U.S., that aims to force the government to slash the emissions that cause climate change. Young people around the world, led by Swedish teen Greta Thunberg, are also organizing “climate strikes,” where young people will skip school to discuss the urgency of doing more about climate change and protest how little progress the authorities have made. On March 15, tens of thousands of U.S. children plan to take part in a global action by walking out of schools. Large numbers of European students are already staging similar events. Some critics are arguing that these young activists are serving as pawns of manipulative adults who are eager to use fresh faces to tout their own cause. The writer Caitlin Flanagan dismissed them as “jackbooted tots and aggrieved teenagers” and Feinstein referred to “whoever sent you here” during her brush with the Sunrise Movement. But as sociologist Rebecca Klatch has found, teen activists have historically tended to echo their parents’ views authentically, just with more energy and enthusiasm. 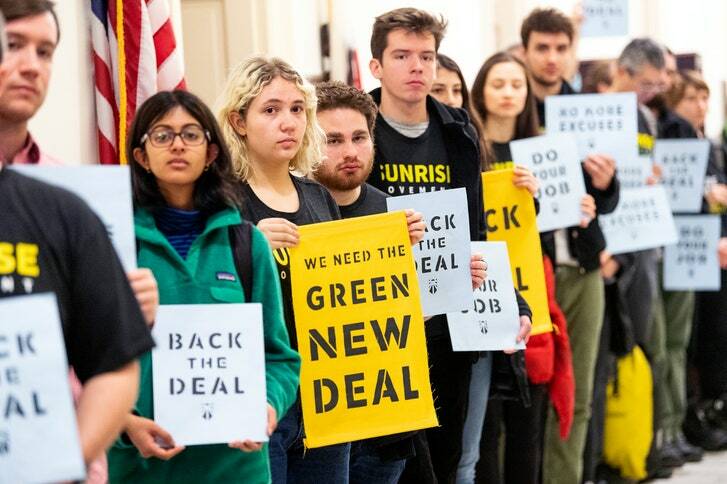 As they promised, supporters of the Green New Deal massed outside Senate Majority Leader Mitch McConnell’s office, waiting to talk to him about the urgent need to respond aggressively to climate change. Unlike Senator Dianne Feinstein, McConnell didn’t offer sympathy for their concerns, condescending comments about their understanding of politics, or internships for the activists. He didn’t even show up. Rather than meet with them, he called out the police and had 42 activists arrested for clogging his office and hallways. McConnell has already said that he will put the Green New Deal resolution on the Senate floor, and oppose it vigorously. He hopes to embarrass and divide Democrats, and use the threat of environmental activism to raise money and animate his campaign for reelection. Successful social movements polarize, and McConnell is clearly a prime target for the Sunrise Movement. The young activists will keep organizing, and McConnell will help in drawing a line between supporters and opponents. There is a question about how to pull support from less than enthusiastic allies like Sen. Feinstein. Right now, support in Congress is not close to enough to pass the resolution in either house. Provoking McConnell might actually help in raising visibility and generating support. The viral video of Senator Dianne Feinstein discussing a Green New Deal resolution highlights important questions about the friends and enemies that social movements make. Brief clips of children from the Sunrise Movement imploring Feinstein to support their ambitious resolution circulated everywhere, featuring the senator trying to explain her opposition and her alternatives. A fuller video, pasted below, offered more context. If you wade through all 14 minutes, you’ll find plenty of condescension all around. Senator Feinstein welcomes the children, acknowledges climate change as a real and serious problem (not a majority position in the US Senate), and explains why she wants to promote more modest measures that might actually pass the Senate. She explains that she represents voters, and knows the legislative process very well. The younger and older children emphasize the urgency of the problem, America’s failure to act, and the necessity of bold action. They are impatient, and not at all interested in Feinstein’s discussion of the dynamics of legislation. It’s not a great conversation, and the shorter versions make for better viewing. The real question is what a confrontation like this does for the Sunrise Movement, and what it does for the larger cause of purposeful action to address climate change. I don’t think the answers are easy. The Green New Deal is a holder for a range of aspirational social, economic, and environmental goals that represent bold moves to confront a set of truly urgent and mostly global problems. In a scant 14 pages, the Green New Deal promises to end pollution and the discharge of greenhouse gases in power production, create millions of good jobs, a sustainable healthy food system, improve public education, and substantially reduce economic inequality–among other things. Here’s the text Representative Alexandria Ocasio-Cortez (Democrat, New York) introduced in the House. Senator Edward Markey (Democrat, Massachusetts) introduced the resolution in the US Senate. Offered as a non-binding resolution expressing the sense of each house of Congress, it’s far more important as a symbol of support and action than a set of developed policy proposals. The resolution gives supporters in office the chance to take a stand without actually having to make policy, and if all goes well, forces opponents to go on record against doing something. More importantly, it gives activists something to focus on, organize around, raise money for, and carry into movement and electoral politics. The broad, vague resolution is an effort to avoid the difficult and detailed politics of regulation, taxation, and spending. Much as “the wall” became shorthand for a range of anti-immigration policies, the Green New Deal is a code for progressive economic policies coupled with infrastructure development and comprehensive, albeit unspecified, environmental measures. Paradoxically, the debate about the Green New Deal is far simpler than an informed debate about, for example, developing high speed rail, one promised component. It’s a good strategy for movement politics, big and bold, and simple, without the baggage and difficult trade-offs associated with legislation. Movements set a broad agenda, and elected officials respond with something significantly more modest, compromising and diluting bold goals in the service of incremental progress, selling out their strongest supporters in the process. It’s exactly the sort of frustrating politics that the founders envisioned. It’s worth noting that Senator Markey built his early career in Congress as a key supporter of the nuclear freeze proposal in the early 1980s. 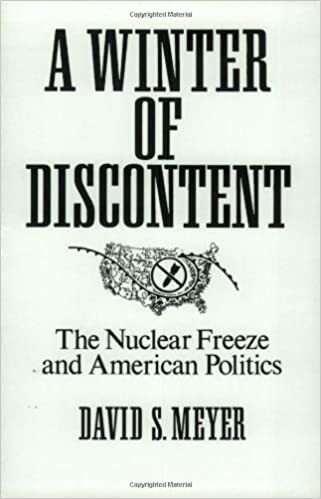 The bilateral freeze on testing, production, and deployment of nuclear weapons was an expressly simple approach to ending the nuclear arms race, and the centerpiece of a broad social movement. The freeze cut short complicated debates about throw-weight, missiles with multiple warheads, or verifying arms control agreements. It also worked….somewhat…restoring some measure of restraint in the arms race and bringing back arms control. (It’s the subject of my first book.) But it didn’t eliminate all nuclear weapons or stop nuclear proliferation. Now Sunrise Movement activists are putting as much pressure as they can on people who support them. Right after last November’s elections brought the Democrats into power in the House, young activists poured into incoming Speaker Nancy Pelosi’s office and staged a sit-in. Rep. Ocasio-Cortez joined them. Speaker Pelosi endorsed their energy and expressed sympathy for their goals….but not quite the Green New Deal; she has her own broad agenda. In real life, at least for now, Speaker Pelosi and Senator Feinstein will meet with the activists, acknowledge the problem of climate change, and offer partial remedies. This makes for publicity and viral videos. But softer versions of environmental protection are hardly the greatest political obstacle climate change activists face. The president, his administration, and the Republican leadership of the Senate refuse to acknowledge climate change, much less economic inequality, as a real problem. Young Kentucky Sunrise activists have promised to confront Senate Majority Leader Mitch McConnell. (I’ll predict with some confidence that they won’t get ten minutes of video in his office.) Indeed, Senate Majority Leader Mitch McConnell, has announced that he will put the Green New Deal on the senate floor, intending to embarrass Democrats–whether they vote for or against it. Targeting Feinstein raises the profile of the issue and the movement for the moment, but she’s not the real obstacle. But focusing on less enthusiastic or more critical allies might also divert attention from the real culprits. Climate change activists were glad to circulate the video from Feinstein’s office. Republicans were happy to retweet them. We remember the mass shooting at Marjory Stoneman Douglas* High School not because of its horrific details, but because of the heroic organizing efforts of the young survivors. A core group of kids were still in shock when they vowed to protect other young people from what they had just lived through. They organized local and national demonstrations, lobbying trips to Tallahassee and Washington, DC, a national school walk-out, boycotts, and a successful voter registration campaign. They defined the problem of gun violence broadly, including crime, suicide, and police violence, and they offered reform measures. 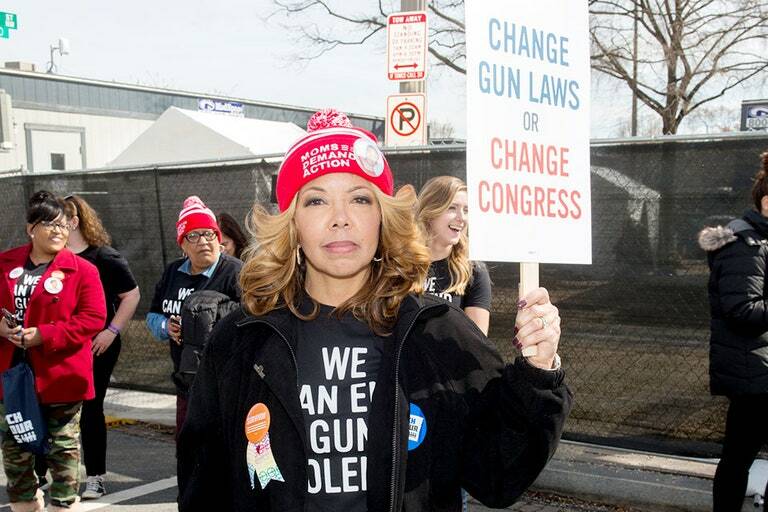 They consistently targeted the National Rifle Association and its corrupting effects on national politics. The survivors forged contacts with celebrities, became media darlings, and shared their spotlight with far less privileged young people. Every major newspaper and media outlet is featuring coverage of the anniversary. The New York Times, as example, featured an update on the shooting’s impact on the community, a scorecard of gun violence since the teens declared #NeverAgain (spoiler: they were overly optimistic), and an op-ed by the master organizer, Jaclyn Corin. Vox published German Lopez’s frequently updated inventory of America’s gun problem and reform efforts. The Los Angeles Times published a report on parents who lost children in the mass shooting. The Hill reported that the House Judiciary Committee advanced a bill that would require universal background checks for gun purchasers. I wrote about the impact of the movement and the long road ahead in The Washington Post. 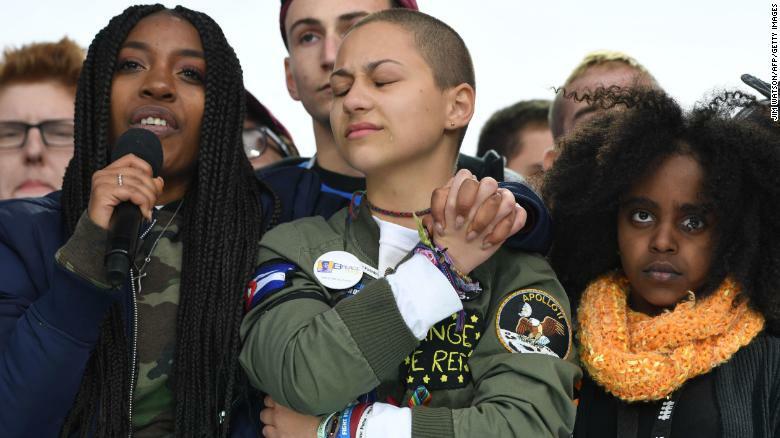 March for Our Lives, the new group founded by the young activists, announced that it would be going silent for a few days, so the kids who had been working tirelessly on gun politics while navigating the rest of teenage life, could rest and heal…a little. The important thing right now is that they’ve gotten others to talk. In the peculiar politics of guns in America, attention to gun violence and remembering the tragedies is always to the advantage of reformers. For decades the NRA has enjoyed such a large financial and institutional political advantage that silence is complicity. Santa Fe, Texas, May 18, 2018. Las Vegas shooting, October 1, 2017. Pulse nightclub shooting, Orlando, Florida, June 12, 2016. Sandy Hook Elementary School, Newtown, Connecticut, December 14, 2012. Batman movie theater shooting, Aurora, Colorado, July 20, 2012. Virginia Tech, Blacksburg, Virginia, April 16, 2007. Columbine High School, Littleton, Colorado, April 20, 1999. University of Texas tower shooting, August 1, 1966. This list is far from exhaustive, but it is exhausting. The Parkland kids have made it harder to normalize–and neglect–the problem of gun violence. Memory isn’t a remedy, but it’s the necessary first step to reform. *I initially spelled Marjory Stoneman Douglas incorrectly. Happy birthday, Rosa Parks! 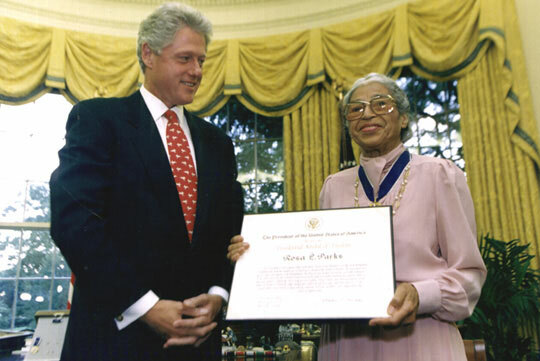 Born on February 4, 1913, Parks was not a tired old lady in 1955, when she refused to move to the back of the bus. She was an experienced and committed activist, deeply tied into the activist networks that animated the civil rights movement. She wasn’t the only one who took a risk to challenge segregation laws in the South, but that hardly makes her less heroic. Activism in the civil rights movement was hardly a career move for Rosa Parks. She paid a serious price over many years for stepping outside of expected norms of behavior and into history. Her role in sparking the bus boycott brought her a bit of celebrity that made it hard to find work in Montgomery, and soon afterward, she and her husband moved to Detroit, where she continued her activism. Jeanne Theoharis’s The Rebellious Life of Mrs. Rosa Parks (Beacon) extends the story of the civil rights icon, undermining the myth of spontaneity surrounding the Montgomery Bus Boycott. The popular version of the story recounts Mrs. Parks as a tired old lady who unexpectedly decided to resist a bus driver’s order to move to the back of the bus. Theoharis describes the deep roots of Mrs. Parks’s activism: she was raised by a grandfather who supported Marcus Garvey, married to a long time civil rights crusader, and had served for more than a decade in a leadership role in the local NAACP. In the summer of 1955, she attended a workshop on civil rights at the Highlander Institute, where she read about civil disobedience and the Brown v. Board of Education decision. She says that she had decided to resist any directions to the back of the bus long before the opportunity presented. Many years later, on a television game show, for example, or–more significantly–when she accepted the Presidential Medal of Freedom from Bill Clinton, she could be described as an old lady. But that was 1996–forty years after refusing to move to the back of the bus. The popular story makes activism seem like something that comes suddenly, out of nowhere, and unpredictably. The fuller tale, just like the one about the Greensboro sit-in, shows that it generally takes long and focused efforts to create those seemingly spontaneous moments. 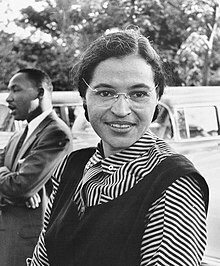 And recognizing that Rosa Parks is only one of the best known of many many civil rights heroes suggests the possibility that each of us could also, one day, step into history. 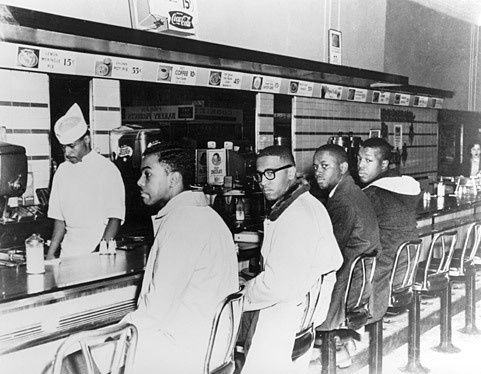 Woolworths in Greensboro, North Carolina, was the site of a new phase in the civil rights movement, the beginning of the sit-in campaign. Anniversaries help us remember important events and twists in history, but they invariably simplify longer and more complicated stories. 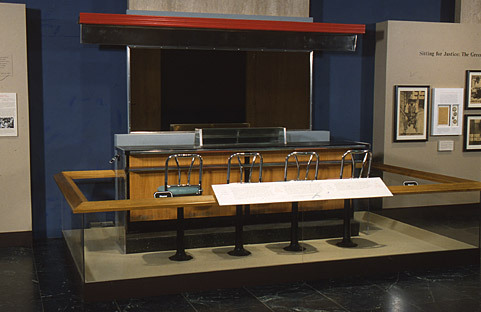 The drama of the Greensboro sit-in makes for a good entry into thinking about the civil rights movement, and into thinking about how regular people sometimes make history. The names of Baker, Blair, McCain, McNeil, and Richmond are not particularly well-known today, not like those of Rosa Parks, Martin Luther King, John Lewis (who would lead SNCC), or Thurgood Marshall. The names of the thousands of young people crusading against segregation with them are even lesser known. But movements are only possible and potentially effective with people willing to take risks without counting on seeing their names in the history books.